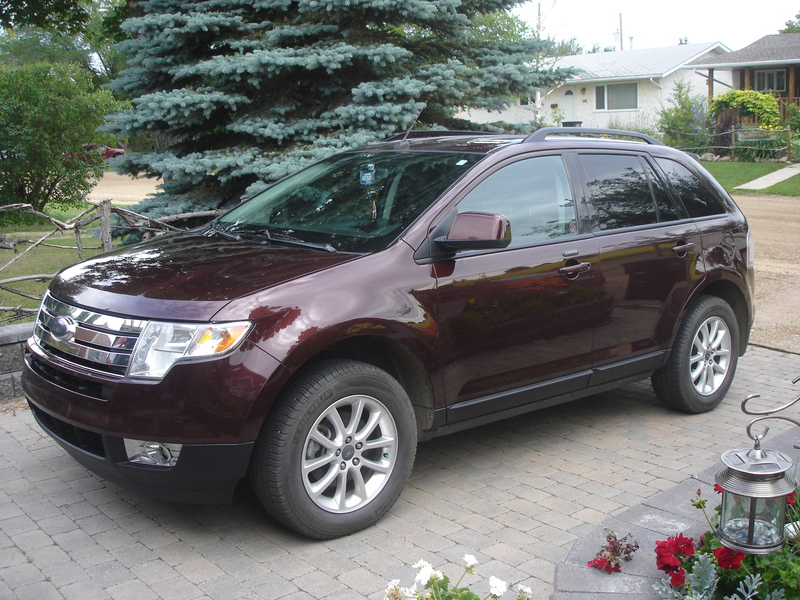 My Ford Edge — all cleaned and shiny! It took me about 5 hours but that baby is nearly show-room clean! Inside and out. Although I enjoyed the process of cleaning it (I’m wierd like that) I have to say that I’ll never do it again. It took much to much time and my back and shoulders were killing me when I was done. Next time, I’m taking it in and paying the $100 to have it done. So, yeah. That was my Tuesday. Day 211 — It was a work inside kind of a day. Very cool again, but at least some sun. Am working on some writing projects (which I will stay mum about until I’m confident that I’ll actually finish them) and just in general did house-stuff. The pergola is all but finished. We just need to do some of the fine details and then it will time to move furniture under and enjoy it. I am thrilled — and, as I said before, it is beautiful. My husband does good work. Had dinner last night at my favorite pizza restaurant — Famoso. A new one opened up on 97th Street near 153rd Ave. I still think my favorite Famoso spot, though, is the one up on St. Albert Trail near the theatres. For some reason the atmosphere and the pizza are just that much better there. All the same my margherita pizza with Italian ham was delicious! Days 208 – 210 — It’s 7:47 Monday morning. It’s going to be another cool day here in Bon Accord. The weather we’ve had this past weekend made me feel like Fall is coming. Saturday the high was 18, Sunday 16 and today — 17. I took a look at the long-range forecast praying that it was going to get better, and, it does. Starting tomorrow there is a warming trend. And it looks like it will last straight through the month of August! Yeah! It was so cool yesterday that I wore jeans, a long-sleeved denim shirt and a vest to work on the yard. Tim wore a heavy sweatshirt while he worked on the pergola. The sun barely peeked through all day, and it put me in mind of all those stupid dooms-day stories where the sun is blocked out by clouds of radiation or dust or whatever and the earth becomes a cold and miserable ball of straggling humanity that burns whatever it can find in effort to create warmth and comfort. And there is no rainbow, ever. Yes, I know. A little drastic in light of a few days of cool, rainy weather. But, still — this is July! It’s supposed to be hot and sunny! I’ll put on those jeans again today, finish my yardwork and be glad that tomorrow the sun will come out. It’s not quite finished. . . but, it’s nearly there, and man, is it going to be gorgeous! and the Lord said: Let Kathy have a pergola! Just a few more shots of the garden as summer waxes on. Day 205 — Spent a lovely afternoon with my granddaughter and my sister-in-law. Went for lunch at Cora’s (not all that good), then went out to Salisbury Greenhouses (lovely place) and afterwards, ice-cream at Dairy Queen (always good). Hailey was a little confused at first about why Michelle and I would want to go see a ‘green’ house. We laughed and tried to explain, but until we got there I don’t think she truly understood where we were going. Thankfully, Salisbury, like most greenhouses these days, isn’t just full of plants. They had lovely furniture, gift ware, jewellery, clothes and ornaments. We had too much fun looking at jewellery and Hailey modelled purses and scarves for us. She is becoming such a charming and funny young girl. Went for a walk in the evening with my friend Shelly. Stopped by for a quick visit at my son and daughter-in-law’s place, ran into a friend I hadn’t seen in ages and stood talking in the street for a good 15 minutes. I love living in a small town! This is such a great talk — and something the world needs more of — especially right now. Day 204 – Monday, Monday. Woke up to rain. A laid-back sort of day. Read. Am cruising right through Mr. King’s short stories. Perfect summer diversion. Nothing terribly noteworthy. Just a rather cool, but nice day in the middle of summer.